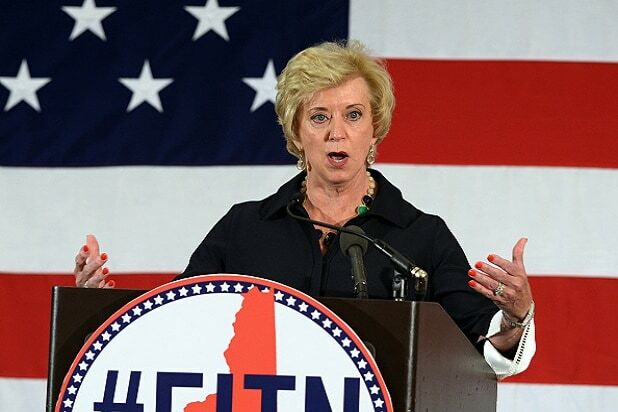 President-elect Donald Trump will nominate former WWE executive Linda McMahon as administrator of the Small Business Administration, his transition team announced Wednesday. McMahon’s selection for the cabinet-level position aligns with Trump’s “America First” agenda to “bring back our jobs and roll back the burdensome regulations that are hurting our middle class workers and small businesses,” the president-elect said in a statement. McMahon helped grow and run the WWF/WWE from 1980 to 2009. She left the wrestling organization in 2009 in order to run for the Senate in Connecticut, but lost to Democrat Richard Blumenthal. She ran again in 2012 and lost to Democrat Chris Murphy. McMahon was also an early supporter of Trump and has donated to various Super PACs in support of his election.